Turn your debit card on and off from your phone. SecureSwipe for your New Era Bank debit card gives you control over your cards with the touch of a button. You can help reduce fraudulent transactions by locking your debit card until you are ready to use it. By creating a unique connection between your mobile device and your card, and giving you control, SecureSwipe is your key to added security and peace of mind. 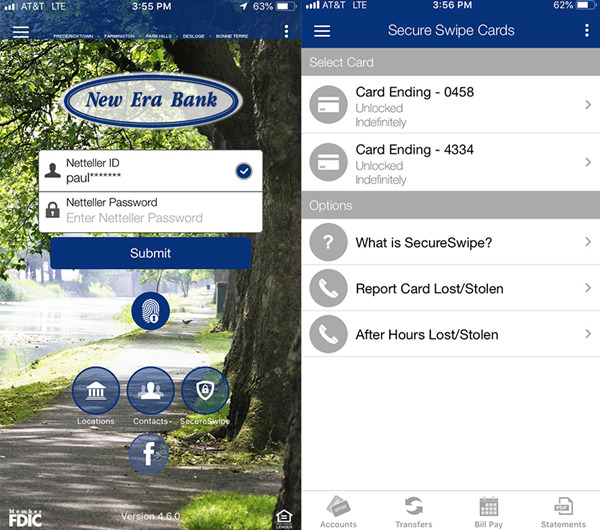 Download the New Era Bank Mobile Banking App for iPhone or Android, click the side menu at the top left corner and then click "SecureSwipe." You will be prompted to enroll for the service with the details of your active debit card and to create a four-digit passcode. The four-digit passcode is meant to allow quick and easy access to the debit card options from your mobile device. Now that I am enrolled in SecureSwipe, when does the service start? Upon enrollment completion, the service starts immediately and your card will be placed in 'locked' status. What does it mean when my card is locked? This term means the card is inactive and one-time debit transactions will be declined at the merchant. Recurring Debit Card transactions will be processed without inconvenience should the card be in a "Locked" status. *Locked cards will accept payments only if flagged by the merchant as recurring. Please read this section in the SecureSwipe Terms and Conditions for more detailed information. **Some local businesses, may not currently send recurrence information with automated debits. SecureSwipe users are reminded to check their accounts frequently to ensure all bills are paid on time and, if not, to make different payment arrangements for those merchants. What does it mean when my card is unlocked? The card is active for one-time and recurring debit transactions for as long or as many uses as you choose. When I lock or unlock my card, how long does it stay that way? Currently you have the option to lock your card, unlock your card for 1 transaction or 10 minutes (whichever comes first), 3 transactions or 30 minutes, 6 transactions or 4 hours, or 12 hours with no transactions limit. Upon reaching your usage/time limit, the card will automatically lock again. Do I need an Online Banking ID to use SecureSwipe? Customers do not need an active Online Banking ID to access SecureSwipe. The login to SecureSwipe is a separate process from logging into Online Banking; although both are done within the Mobile Banking application. Can I enroll multiple cards? After enrollment, you will have access to all active debits cards that are attached to your account(s) at New Era Bank. What happens if I get locked out of SecureSwipe? If you find your card locked and you're having trouble unlocking it, please call Customer Service at 573-783-3336.